Scott Fitzpatrick produces a self-portrait, laser printed onto 16mm film. Axel Petersén produces the portrait of Mustafa Arhan, a famous oriental carpet seller, living in Sweden, the protagonist and victim of a scam, reflecting the history of a country, and of everyone. Steve Reinke paints a portrait of the artist, writer and activist David Wojnarowicz in seven days, celebrating his own disparate and poetic life. It’s about Wednesday visits with his friends, villages on fire, Kafka, Bette Davis, Hollis Frampton and Sammy Davis Jr. transformed into a libidinal machine producing sadness, opera, disembowelment and poetry. "The centre of the world"
Stéphanie Rollin and David Brognon film a young boy lining up glass marbles, providing a literal and applied measure of the passage of time. In Ghana, Eleonore de Montesquiou confronts images of young people with ambiguous discourse about aggression and the accountability of the victim. Justin Schmitz films teenagers in the blurry landscapes of American suburbs, and observes the tentative borderline between adolescence and adulthood. Julia Charlotte Richter follows three boys in the deserted streets of a residential city. They become the protagonists of a fictional scene, following a catastrophe. Mike Crane films a leisure centre located in a former Soviet building in Lithuania. An actor plays the role of a Red Army General, teaches his idle teenage audience about the values of a market economy, and gives them a history lesson about Soviet occupation in the Baltic States. 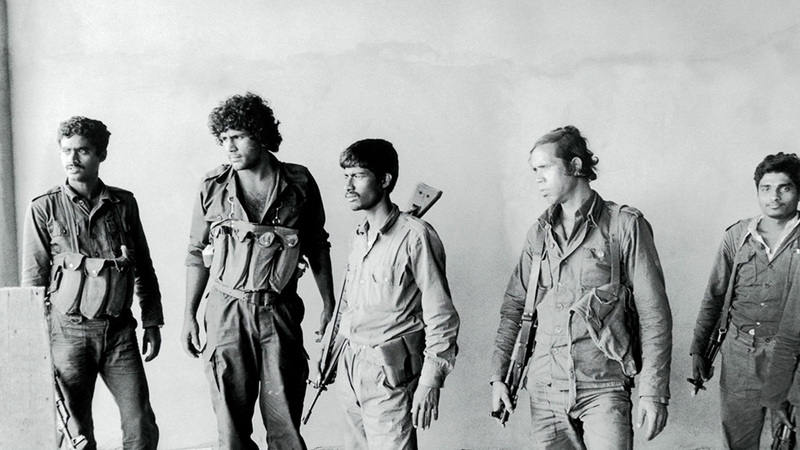 Naeem Mohaiemen explores the tragic utopia of the Revolutionary Left Party in the 70s, snapped by a Magnum photographer in 1982, where Bengali fighters seem to have joined the struggle of the PLO in Lebanon. Mohammad Shawky Hassan recreates an exile map, from images taken in the United States and absurd and indecipherable snippets of patriotic Egyptian conversation. Akosua Adoma Owusu directs an epistolary film. A young man in the United States writes to his mother in Ghana, he strives to reconcile his love for her with his desire for men. Keina Espiñeira films men on the coast waiting to travel to Europe. This beach is in a state of limbo, without spatial or temporal reference. Myths from the colonial past come up against the present, where memory lives on. Ben Rivers examines the landscape of the volcanic archipelago of Vanuatu before it is destroyed by cyclone Pam. In a faltering voice, a woman reads a poem by Henri Michaux about a distant country. These images become the ghostly vestige of an irreparably damaged ecosystem. Panel discussion - "Image politics"
Rencontres Internationales invites artists, curators and artistic directors, as well as programmers from museums and contemporary art centres in the fields of contemporary cinema, video and new medias. After a short presentation of their organisation/institution, speakers will outline their work, the issues and concerns faced, in the field of moving images and digital arts. Secondly, everyone will discuss the changes observed in artistic and cultural practices, and what should change in the way of thinking about these practices. Johan Grimonprez conveys the demonstration that took place, in Sorocaba, in Brazil under military dictatorship at the time in the 80s. A judge banned any kissing in public, with the penalty of a prison sentence. The town responded with a huge ‘kissodrome’. In ‘Every Day Words Disappear’, he gives the floor to Michael Hardt, an American political philosophy theorist, who raises questions regarding the means of transforming a society defined by a permanent state of war, fuelled by the industry of fear, in a reality which depends on the exploitation of people and the cult of the privatisation of common goods. In contrast to Machiavelli’s quote, according to which it is preferable for the Prince to be feared rather than to be loved. Lili Reynaud Dewar reflects upon the appropriation of objects, cultural and social identities. In this film, science fiction, rap and discourse on emancipation intersect in the specific cultural and political context of the city of Memphis, once the historic epicentre of slavery, and centre of the fight for African-American civil rights. Based on images taken in an airport, the symbol of a global society, Peter Downsbrough examines the act of filming and the structuring of language in moving images. Graham Kelly examines cultural and technological developments in contemporary image. Based on different film versions of ‘King Kong’, he highlights the preponderant importance of the socio-political context in which the public receives these images. Dan Ward documents the shooting of motion capture. Everything in the studio is made to standardise the implementation process. Joshua Mosley uses animation to recreate a game of real tennis that took place at the Château de Fontainebleau, in 1907. With skilled editing, he resumes the idiosyncratic moments of hesitation, the different degrees of concentration and what he calls ‘human consciousness’. Damir Ocko explores the mechanism of a film set where third degree burns are filmed. In English the term ‘third degree’ means both a very bad burn and a confession obtained through torture. Sebastian Diaz Morales examines the mechanisms through which we perceive the constructed nature of reality. Fiction and reality merge; fiction appears to self-generate.